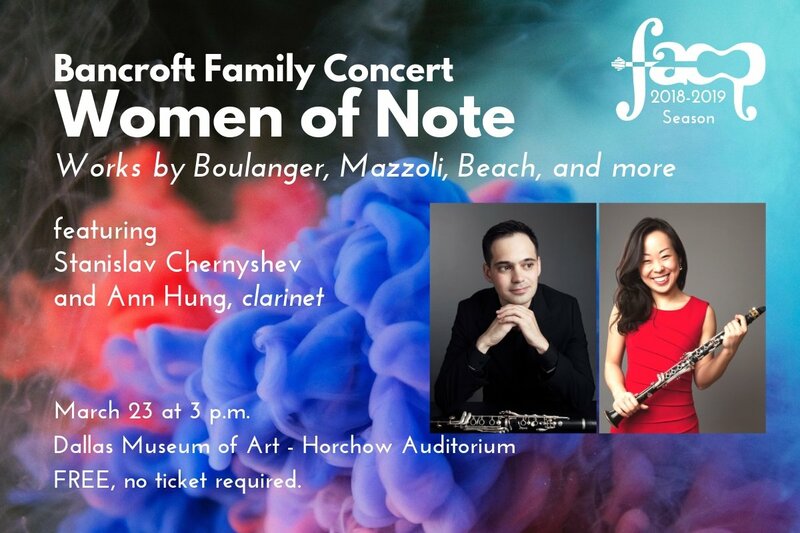 Ann Hung and Stanislav “Stas” Chernyshev not only play the same instrument; co-lead Opus Nova, a new chamber music series in Fort Worth; and will perform together at FACP’s Bancroft Family Concert: WOMEN OF NOTE; but they are also married! The dynamic duo took a moment to give our audience a glimpse at the program, which focuses on female composers, and some background on their lives and careers. 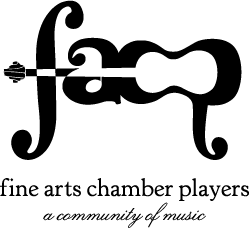 What piece on the program are you most looking forward to sharing with our audience, and why? Ann and Stas: Missy Mazzoli’s trio “Lies you can believe in.” Not only Missy Mazzoli is one of the most inventive living composers these days, she is also close to our age and speaks the musical language of the 21st century. When did you start playing the clarinet? Why did you choose the instrument? Did you learn other instruments? Ann: I started to play the clarinet when I was 10. My mom actually chose it for me, simply because it is an easy instrument to carry around. I also play the piano, and I started the piano when I was 5. Stas: I started the clarinet when I was 13. I heard Benny Goodman play the clarinet on the radio and immediately fell in love with the sound. That’s what made me want to learn this instrument. I also play a little bit of piano, I started at the age of 8. When did you decide to pursue music as a career? Ann: I have been in music school since 3rd grade. Of course there are some difficult times when I just wanted to play outside with friends instead of sitting in front of a music stand and practicing, but music brings me so much of joy, I’ve always known I wanted to do something that relates to it. Stas: I decided to be a professional musician after I won my first solo competition at age 15. Who’s your favorite composer to listen to? To play? Ann: It’s hard to pick just one, and it changes with time. Lately I’ve been in love with Scarlatti, Ravel, and Beethoven. But Brahms has always been my favorite to listen and play without a doubt. Stas: Bach, Beethoven, and Brahms. What advice would you give 14-year-old Ann and Stas? Ann: Practice and listen to music as much as you can! Enjoy the time that practicing is the only thing you need to worry about (ha-ha)! Stas: I would definitely give myself lots of life advice if I could go back! If we are talking about music, I would suggest myself to practice more and attend as many concerts as possible. What advice would you give to a high schooler who wants to pursue music in college? Ann: Know that you are going to spend the majority of your time alone in the practice room whether you are free or not: holidays, weekends, finals–doesn’t matter. If you still think that’s something you want to do, then yes! Follow your heart! It’s a hard path, but I guarantee the result is just as gratifying as it can be. Stas: If you decide to pursue music as your career practice hard, but don’t forget to have a life as well. Your life experience is what makes your music unique. The music has to be personal and it has to come from your heart. What’s your favorite sound? Ann: The waves from the ocean. Stas: I recently heard a Mariachi group, one of the instruments there called guitarron (basically a bass guitar), absolutely blew my mind.